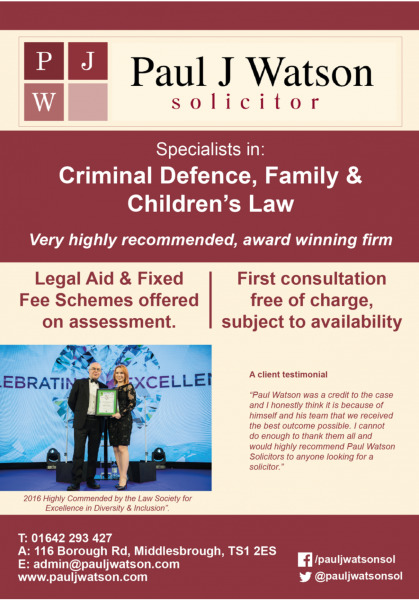 We know that you don’t need a Solicitor every day, but when you do, call Paul J Watson Solicitor first on 01642 293427. We are a small family based firm with a down-to-earth, open and honest manner. Our legal team make sure that they communicate with you in straightforward terms so that you can understand what is happening at each stage of your case. Whether you need help with a criminal or family law matter, we will do everything possible to fight for you and achieve the best possible result. We are a leading law firm in the Middlesbrough area and have provided our services to the Teesside community and beyond since the firm formed in 1987. Cost is a major factor in most cases and we pride ourselves on offering an affordable service. We will assess you for eligibility for legal aid and help you make an application. Even if you find that you are not eligible for legal aid, we offer fixed fees in the majority of cases, which you can pay for in stages by a number of methods, including credit cards. Clients receive free initial consultations to discuss the merits of your case. All police station attendances are free of charge – it is important that everyone is aware that if you need to go to the police station it is always free to take a solicitor with you because everyone automatically gets legal aid, regardless of their means.